The director of Nursing at Franciscan Children’s hospital in Massachusetts was strangely drawn to the baby. “Who’s this beautiful angel?” Liz asked the nurse wheeling the eight-month-old down the hospital halls two years ago. “Her name is Gisele,” the nurse told her, according to The Washington Post. And this fateful encounter was to set about a chain of events that would allow Liz to become the mother she always dreamt of becoming, and Gisele to given the love and family home every child should have. Baby Gisele, a ward of the state, had been at the hospital where Liz worked for five long months, but she had never seen her before. Born prematurely at another hospital, little Gisele was underweight and suffering from neonatal abstinence syndrome – a result of her birth mother using heroin, cocaine and methadone during pregnancy. 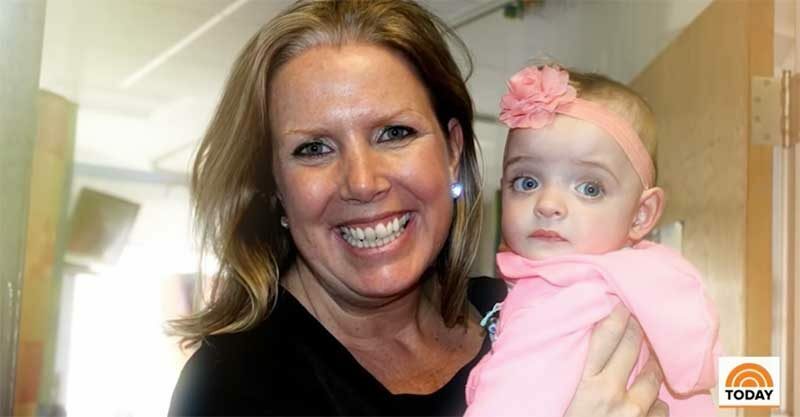 The state of Massachusetts took custody of Gisele when she was three months old and transferred her to Franciscan Children’s because her lungs needed specialised care. But without a single visitor in five months, the little girl was on the verge of entering the foster care system – that is until Liz came along. While Liz, 45, watched her siblings get married and have kids and became the ‘world’s best aunt to 13 nieces and nephews’ life didn’t turn out for her the way she’d hoped. She never met her ‘one’ and so by the time she was nearing 40, her sister suggested they look at IVF to pursue her baby dreams. But when she received a devastating phone call from the IVF clinic saying her health insurance wouldn’t cover the costs, she knew this door was closed. Although fostering and adoption was suggested to her, Liz felt that she wanted to carry her own baby. That was until she saw Gisele. All of a sudden, adoption felt right. “Since the moment I met her, there was something behind her striking blue eyes capturing my attention,” she said. “I felt that I needed to love this child and keep her safe,” Liz told The Washington Post. After putting in a request to foster Gisele, Liz started sitting with her every night after her shift, speaking softly and familiarising Gisele with her voice. Being a nurse, the agency trying to place Gisele in care felt that Liz would be a good fit to take care of her. Three weeks later, in April 2017, when Gisele was nine months old, Liz received permission to take her home – with the stipulation that every effort would be made by the state to reunite Gisele with her birth parents. Her friends at work threw her a baby shower and helped to set up a cot in her bedroom. While Gisele’s birth parents were initially granted weekly supervised visits, they later lost their parental rights and the door was ore opened for Liz to adopt Gisele. Then last year on Oct. 18, in a courtroom filled with Liz’s family members, co-workers and friends, a judge signed off on Gisele’s adoption and presented Liz with legal documents certifying that she was now the girl’s mother.